Matrix switch is a high-performance matrix switcher designed for video and audio signal routing. It supports unbalanced audio, Composite, RGBHV (Component), or VGA (DB15). Matrix sфwitch is a high-performance matrix switcher designed for video and audio signal routing. It supports unbalanced audio, Composite, RGBHV (Component), or VGA (DB15). 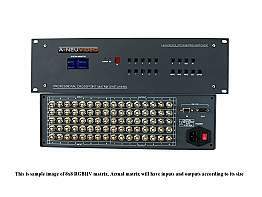 This is a professional crosspoint RGB Matrix Switcher from A-Neuvideo, offering 24 Component BNC inputs and 8 outputs. It uses high-performance IC chips and features a 350MHz bandwidth supporting resolutions up to 2048 x 1536/60Hz and 1280 x 1024/120Hz. Switching of multiple RGBHV sources with stereo such as computers to multiple displays. The VGA output of a computer display adapter places synchronization signals on separate wires from the R, G and B colors.